On a recent outing to take photographs of Big Tree nominees, I was surprised to see a dawn redwood (metasequoia) on the list. A native to the Szechuan and Hupeh providences of China, I had assumed - incorrectly - that all the dawn redwoods in the U.S. were located on the west coast. What first struck me about this dawn redwood was its sheer size and expansive root system, partially visible at the base of the tree. 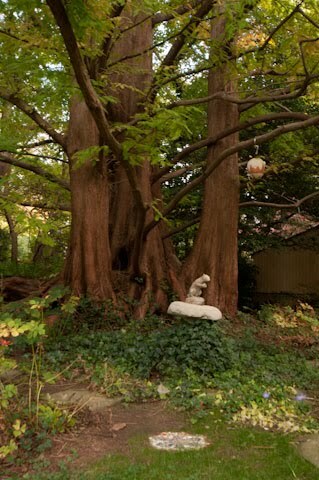 Located in a relatively small backyard, the tree takes up almost all the available space. The other standout characteristic is the color of its bark - a stunning red. The dawn redwood, a deciduous conifer, looks like something from a pre-historic forest. The unusual bark, enormous size and almost fern-like needles are unlike anything I have ever seen. 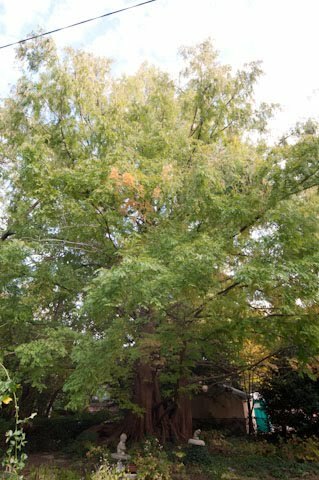 It just so happens, the dawn redwood dates back to over fifty-million years ago and until 1941, the only evidence of the tree’s existence was in fossilized form. Two years after the discovery of a living dawn redwood in China, young saplings were brought to the U.S. National Arboretum. While you cannot freely visit this dawn redwood on Reno Road, you can see others in their full glory at the Arboretum on the lower slope of Mount Hamilton. Location - Native to Szechuan and Hupeh provinces in China. Crown - Pyramidal with ascending branches. Grows somewhat rounder with age. Height - Although the shortest of the redwoods, it grows to at least 200'. Flower - Winter buds; small, pale. Foliage - Deciduous; thin and flat; flowing needles 1/2"-1 1/2" long. Color - Soft green; bright orange-brown in autumn. Bark - Reddish brown or grayish brown; cracked and peeling in strips. Landscape use - Ideal for modern landscape plantings.